– A PhD degree in entomology from Cornell University in 1911. – A position of leadership as head of the Entomology Department at the University of Maine. – A robust publication record, including seminal works like, Food-plant Catalogue of the Aphids of the World: Including the Phylloxeridae (1938). – Economically/ecologically important discoveries, such as the melon aphid’s overwintering host: the orpine weed (Sedum purpureum). – An extensive commitment to outreach, including numerous children’s literature publications focused on scientifically-accurate portrayals of insects. 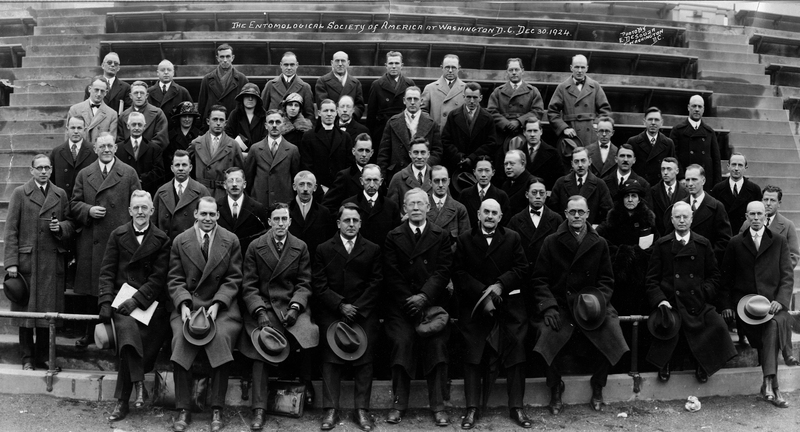 A photo from the 1924 Annual Meeting of the Entomological Society of America. Edith Patch is third from the right in the second row. Click here to enlarge. However, although these accomplishments are outstanding and Edith deserves to be honored for her contributions to entomology, I really don’t care about these bulleted facts, or the bare-bones biographical account of what Edith achieved during her lifetime. What interests me more, as a fellow female entomologist, is not what Edith Patch accomplished, but rather how she practically completed these feats while juggling her own personal needs and societal stigmas against women in science. Why did she decide to pursue a career in entomology? How did she cope with sexist viewpoints? Was she happy? We know that the time period in which Edith came to prominence (1910-20s) was not supportive of women in science. Universities had institutional laws that retracted any funding awarded to female graduate students if they married men who were employed by the university. Why pursue an education after you had already achieved the “pinnacle of success” — marriage? Similarly, one of Edith’s own graduate students who worked as an aphid entomologist for the Canadian Civil Service, was informed by the Canadian government that she would not be eligible for any further promotions after she was married. How did Edith work within these confines? Did she never marry because she never met anyone she was interested in? Or did she perceive her work as too important to be jeopardized by a relationship? Of course, these questions are a matter of conjecture now, but from what I can glean from biographical works on Ms. Patch, Edith simply loved insects. Her childhood passion was accentuated by further knowledge of insects’ inner workings, and Edith found herself not caring if she had to work a day job as a high school English teacher in order to prove to the University of Maine that she was committed enough — and intelligent enough — to be given a stipend. I don’t believe Edith looked back on this experience and others and regretted her life trajectory or felt confined by opinions of women; she had a passion which justified some sacrifices. In fact, I doubt she even viewed it as sacrificing. Yes, Dr. Edith M. Patch had an exemplary career in entomology. But what I find more fascinating was her tenacity of spirit, which enabled her to ignore those who would impede her success and which allowed her to respond with quiet dignity. – Gibbs, K. E. 2014. Without Benefit of Insects: The Story of Edith M. Patch of the University of Maine. Maine Ag. & Forest Exp. Sta., Misc. Publ. No 763. Katherine Todd is an MS student in entomology at The Ohio State University’s Agriculture Landscape Ecology (ALE) Lab, where she is studying how urban green space design in Cleveland, OH impacts wasp communities and niche partitioning of arthropod predators. She is broadly interested in researching ways to restore or improve ecological communities in human-dominated environments — especially ones that are urban or agricultural. Colin you forgot to mention, the great “Susan Halbert”. Yes, I realized it moments after posting. Thanks for adding her to the list, Doris!